Snow storms do not cause mould and mildew, excess humidity and fungi spores do. Mould spores are everywhere in the atmosphere and will settle and start to grow on damp surfaces or in a humid atmosphere. 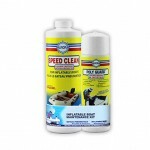 You can use Boat Clean Plus to safely remove it from your upholstery and any other soft surface. If you have it on hard surfaces, use Boat Scrub. Stains are indelible and are difficult or impossible to remove. 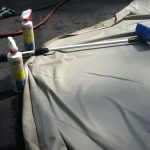 You can protect vinyl upholstery from permanent damage and staining by applying 2 coats of Vinyl Guard to the surface. It will make the mold easier to remove and prevent staining. 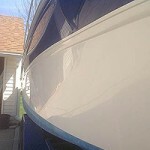 Use Premium Boat Shine on hard surfaces or Sure Step on your deck. The mold will return unless you keep the surfaces clean and dry. The cleaning products mentioned above will do the cleaning, but you should do something to get better air circulation. If the boat is tarped, pull the tarp out from opposing sides or attach a block or tube between the boat and tarp so that air will flow through from one side to the other. If it’s shrink wrapped, you can get plastic vents that are inserted into the plastic, allowing air to flow through, but preventing rain and snow from getting in. You will need a minimum of 2 on opposing sides of the boat for good through flow of air. Make sure that hatches, companion ways or port holes under the tarp or shrink wrap are open to allow air inside the boat. If you have electricity to your boat, installing a dehumidifier or a small fan to keep the air moving will be very helpful. Also installing low wattage light bulbs, 25 to 60 watts in each cabin or compartment will provide enough warmth to keep the boat dry. Other alternatives are using desiccants like Silica Gel, Powdered Zeolite or Active Alumina to dry out the air. Avoid the salt type of desiccant because they give off a corrosive gas that will cause corrosion and rusting to the metals in your boat and may also damage the upholstery.